I finished your socks. Aren’t they nice? You’ll notice they’re too big. You’ll also notice that the mismatched socks on your own feet are too small. That’s because they are mine. Consider this a ransom note. I am back in NY and while I was gone the leaves started to come out on the trees which was a nice welcome home. One of my sisters is home for the summer which was an exciting thing to come home to as well. Wahooooo! My other sister and her boyfriend will be here this summer also which will be the first time we’ve all been in the same spot for more than a week in five years. Maybe if you come rafting you will have a Burns girl as your guide! Onto the socks. While I was in Colorado my man friend said he was running low on socks. It took approximately three minutes to locate a yarn store after he said that. I wandered into a lys in Durango, CO that unfortunately was closing for good. It was a real bummer to see but I’m happy I got to stop in before they did. They had a fun selection of all different sorts of things. 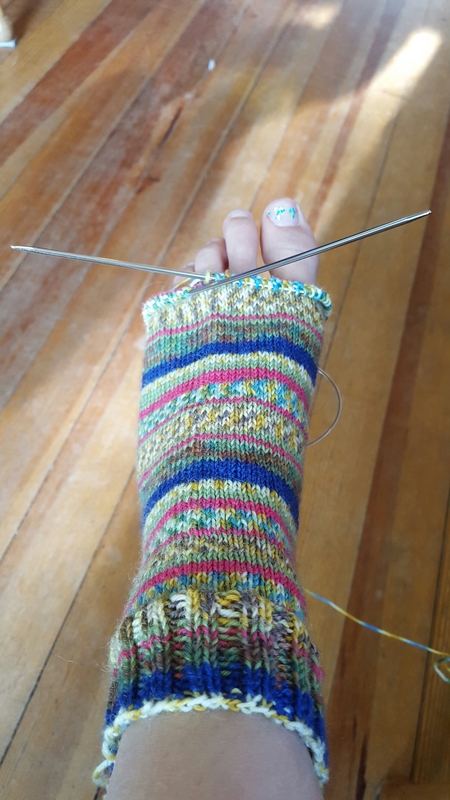 I had to pry myself away from a sock weight gradient kit which was pretty tough. I picked out a couple different sock options for Aaron which was fun, because he will literally wear anything I make. He could care less if it’s hot pink or candy cane stripes. I could knit little kitties and garden gnomes into them and he wouldn’t even blink. He just likes knit socks. What a guy. 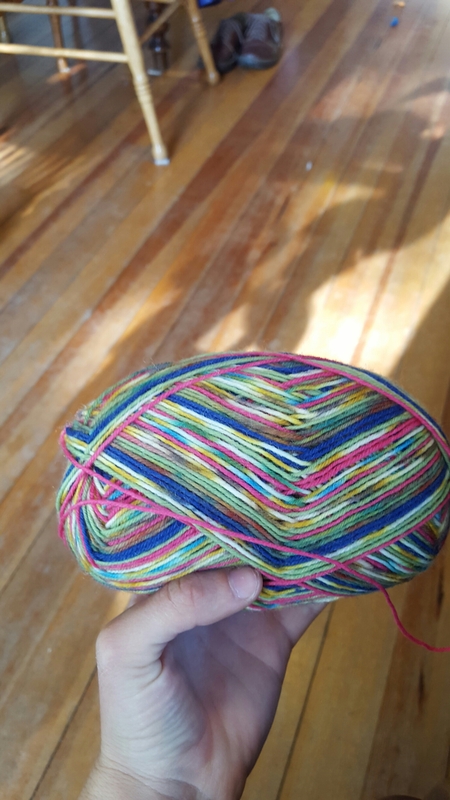 When I had it narrowed down he happened to walk by the window with Oscar (one of our dogs) and we did some terrible sign language complete with yelling through the window even though we couldn’t hear each other, but it was clear he decided on this yarn. It is a Regia self patterning yarn which is pretty fun. I love hand dyed sock yarns but I like to knit with the commercial yarns for him because he is pretty tough on socks and they seem to wear well. No holes yet! 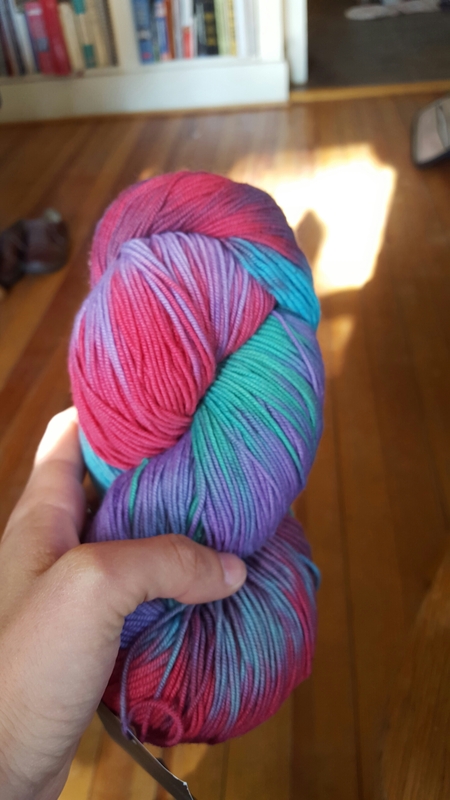 I’ve decided to call this colorway “Rotten Easter Basket” because that’s what it looks like all knit up. Like sad, forgotten peeps and jelly beans. They are 72 stitches and I am knitting them with size 1 Addi Turbos that I bought at the yarn store we went to. And they are SO GREAT. I understand now why people are all about them. They are really unlike any other needle I’ve knit with. I love my wooden Dreamz (even with the dumb name) but I could see myself getting a set of Turbos down the road. Whoa. 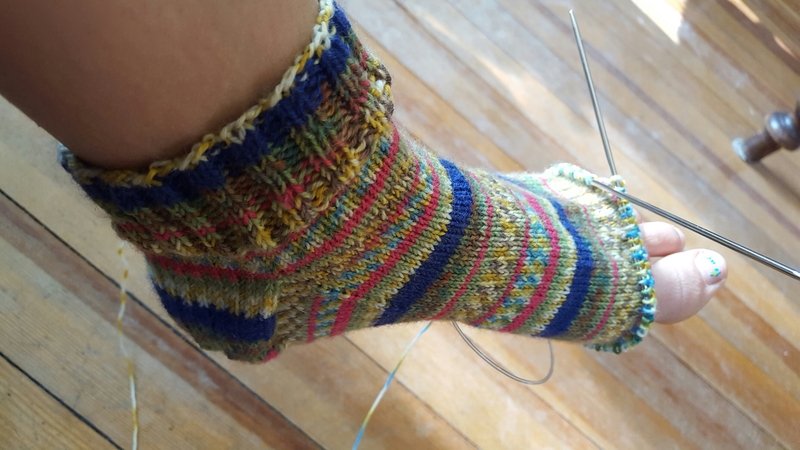 I’m going to keep on keeping on with the socks and hopefully they will be done when he comes to visit. That skein might have snuck into my bag as well. Oops.